Downtown Olympia real estate is located at the southern end of Puget Sound on Budd Inlet. The Deschutes River estuary at Olympia has been dammed to create Capitol Lake. The city has views of the Cascade Range to the east including Mt Rainier. 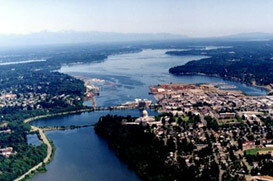 The name ‘Olympia” was adopted because of the views of the Olympic mountains to the northwest. Today’s Olympia homes were once the playground to Native American peoples for thousands of years, including Squaxin, Nisqually, Puyallup, Chehalis, Suquamish, and Duwamish. The first recorded visit by Europeans to the beautify Olympia real estate was in 1792, when Peter Puget and a crew from the British Vancouver Expedition charted the site. With an economic engine fueled to a great extent by state government activity, Olympia enjoys the benefits of a stable work force, engaged and educated community, and well-supported school system. Olympia’s median family income of $53,900 is well above the national average. Olympia homes for sale listings spans downtown condos to luxury waterfront properties alone the southern end of the Puget Sound.